There's been quite a lot in the papers this summer about how awful it is having the kids at home and having to take them on holiday and entertaining them and what a drag blah blah blah. I don't know how old these terrible kids are to be such a drag, but I have greatly enjoyed having mine around. Mine are nearly 16 and 11 and are very easy to keep happy. Just take them to castles, military stuff, hands-on museums with vehicles, trains, and London (especially the Science Museum). We are back from two weeks in Essex and we've had a great time. I did my homework before we left and found a number of places I thought would interest them. 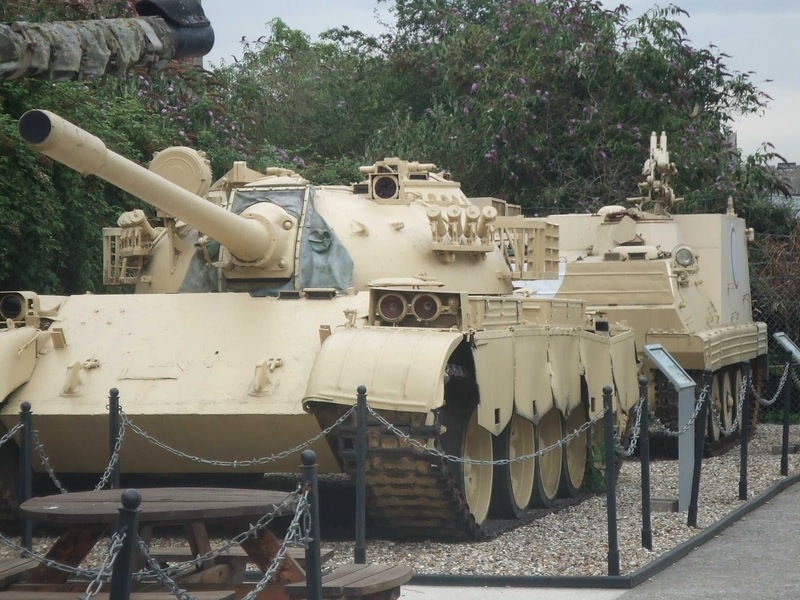 Essex is brilliant for military museums. Their favourite was the Combined Military Services Museum in Maldon and I can strongly recommend it for anyone interested in military artefacts from British history. 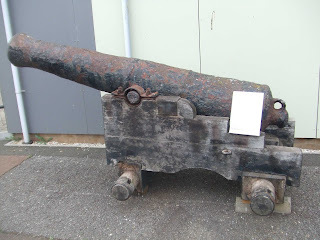 It houses several collections including army uniforms from as far back as the Civil War, RAF full flight gear from WWI, early shipwreck artefacts from the navy plus an amazing array of munitions, special forces weapons and equipment including survival, escape and evasion devices. You can also see a collection of Home Front uniforms and equipment that were used and worn by various essential personnel such as nurses, Land Army, ARP wardens and so on. My mother recognised a lot of what she saw there. There are even items collected by the Essex Yeomanry which was formed originally to counter the French Revolution and is now part of the TA. It shows uniforms and and books from the regiment including mess and cash books, a huge enrolment scroll, and a scrapbook of regimental service from WWI. My favourite though was the Secret Services collection, with items donated by Captain Peter Mason and his wife Prue codename Zoé. If you have always been fascinated by James Bond you'd love the Peter Mason collection. Ian Fleming knew Peter Mason too so it's likely he helped inspire the character of the fictional spy. The collection on view has an amazing array of covert operations weapons and clothing many of which were used by Peter and his wife. They operated essentially during the Cold War so there were lots of opportunities to use their kit. You can see Peter's dapper suit, pictures of him with his beloved fast cars as well as exploding cigarettes, camera pens, tiny pistols and poisoned umbrellas. I spent ages going through it all, admiring Prue's nifty suit and coat that could be turned inside out for a completely different look and had holsters for her pistols. She was a crack shot and took part in a circus in Russia where she could pass on secrets obtained whilst in disguise. It was absolutely fascinating and my mother and I had a lovely time pretending how we would use the various lethal instruments on the baddies. The boys were running around in heaven looking at the collection of swords and knives, various arms and missiles, and trying on some chain mail and armour helmet. 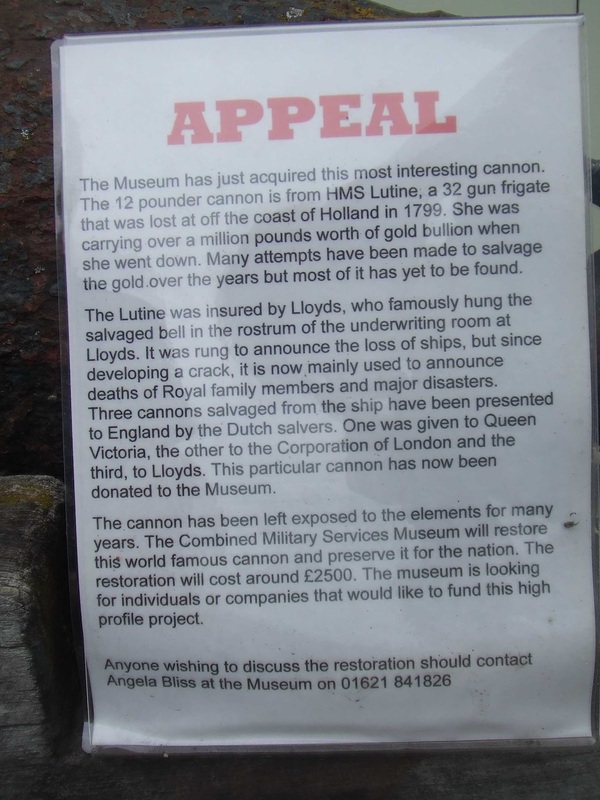 Outside were a couple of Chinese made Iraqi tanks and an Argentinian field kitchen plus a cannon from HMS Lutine that was lost off the Dutch coast in 1799 carrying over a million pounds of gold bullion! 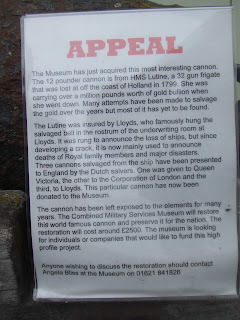 As you can see, it is in a poor state after spending many years outside Lloyds of London and the museum is looking to restore it. They have launched an appeal to raise £2500 so if you know of any individuals or companies that might be interested in participating do let them know. There's a person to call and a number at the bottom of the appeal notice. The museum is a fantastic resource so if you get the chance to go along and visit it, do. A family ticket costs £15.50 and it's well worth it. The staff are enthusiastic and informative and happy to talk about the collections, and it's not busy so you can enjoy browsing in peace.